LET YOUR FREAK FLAG FLY!! CHECK THIS OUT!! 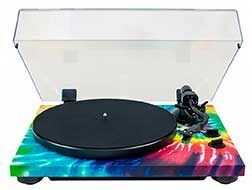 Heavy weight aluminum die cast platter, belt drive, 2 speeds, static balanced S shaped tone arm, high torque DC motor, low friction spindle, high density MDF cabinet, MM type cartridge phono equalizer amplifier, built in USB digital output and analog phono / line output, corrosion resistant gold plated terminals, includes Audio Technica AT95E MM (VM) type phonograph cartridge, manual with lifter arm return, anti skating system, 16.5"W x 4.6"H x 14"D, tie dye color design. I Called Out a Counterfeit Item on Amazon. The World's First DENON 13.2Ch Receiver. Visa Rebate Promo started Friday!